What do The Music Man, the Sound of Music, Annie, and The Lion King have in common? They were all the starting inspiration for Sin City’s hottest musical – Evil Dead The Musical 4D! Okay, that was a lie; but they are all musicals, as is this on-stage production that encompasses the Evil Dead trilogy. 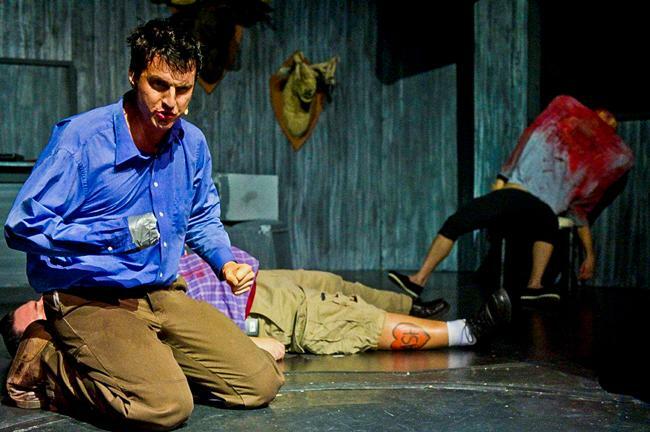 Though Evil Dead The Musical is featured nationwide, this Sirc Michaels produced and directed iteration is everything one could expect from a stage production that features demons, a book bound in human flesh, and a lead that is forced to cut off his own hand. Needless to say, this show is not for children. Evil Dead The Musical is a campy trip through Sam Raimi’s Evil Dead films and includes classic scenes from all three movies, though the bulk of the focus is on the first and second films. The musical follows Ashley “Ash” Williams and his ill-fated friends as they spend a stereotypical Spring Break in an ominous cabin in the woods. As luck for the audience would have it, things go awry and the crew unleashes ancient demonic entities known as Kandarian demons. It’s ludicrous to watch unfold on stage, but the entertainment value blows the roof off of Planet Hollywood’s miniscule V Theater. As with any musical, the story pushes forth through a set list of songs that are all but typical. Classics such as the tango-styled “What the F**k Was That”, the malt shop inspired “All the Men in My Life Keep Getting Killed by Kandarian Demons”, and the staple love song “Housewares Employee” are catchy tunes that you’ll be hard pressed to forget anytime soon after the show. The entire experience sticks with you and reminds you that not all musicals have to be stuffy and formulaic. Evil Dead The Musical also makes for the perfect accent to any party, be it bachelor / bachelorette or birthday, especially if you spring for VIP and Splatter Zone VIP seating. VIP seating simply allows you to sit closer to the stage, but the truest form of VIP is known as the Splatter Zone. Your VIP experience starts off the moment you hand over your ticket, where a ghastly ghoul hands over a crisp, white “Evil Dead The Music” t-shirt. That’s sweet – a t-shirt, a souvenir; but something’s missing. Oh, right; the gallon of blood that you’re going to get doused with throughout the show. The Evil Dead and Evil Dead II are horror flicks that have no problem with utilizing fountains of blood – and the musical is no different. Splatter Zone seats are directly in front of the stage – literally inches away – and come with the added bonus of being sprayed with (make-shift) blood when the action on stage gets a little… horrific. When the play reaches the climax in Act 1, guests soon find out why those shirts were pearly white. By the end of Act 2, you’ll, hopefully, be covered head to toe in the shows bloody concoction. Everything about Evil Dead The Musical is a part of this entertaining gore-fest that fits right at home in Sin City. Tickets are pretty easy to get a hold of, but you’re always best going through services like Exploring Las Vegas for the best pricing on the market. Don’t cheap out on this show, either; the Splatter Zone is the best way to see the action, though a little blood in the eyes may hinder that quite quickly.